If you’re in the market for a subcompact crossover or small SUV near Moore, Oklahoma, look no further than the 2018 Jeep Renegade at Landers Chrysler Dodge Jeep Ram of Norman. This vehicle is capable, comfortable, cute and cool. In fact, it might just be the cutest Jeep to ever hit the streets — but don’t underestimate it. As adorable as the 2018 Jeep Renegade is, it’s equally fierce. This Jeep can go anywhere and do anything with the best of them. It’s adventurous, it’s comfortable, it’s convenient and it’s stylish… what more could you ask for? If you want to get behind the wheel of a 2018 Jeep Renegade, you can find one at Landers Chrysler Dodge Jeep Ram in Norman, Oklahoma. Landers CDJR of Norman customers come in from across the Oklahoma City metro, including Edmond, Moore, Midwest City, Yukon and Del City. The 2018 Jeep Renegade puts an intriguing spin on the classic Jeep brand styling we’re all used to. With elements like the iconic Jeep grille and round headlamps, there’s no denying that the Renegade is a Jeep, but it also exudes a new kind of style and swagger that’s different from the rest of the lineup. The Renegade is part of a new wave of smaller, subcompact SUVs. It has an aesthetically pleasing boxy design that is somehow both ruggedly bold and perfectly adorable at the same time. There are a number of ways you can customize your Renegade, too! You can get the available deep-tinted glass to add an element of mystery, or the wraparound black roof if you’re going for a sleek, high-contrast look. You can also get the My Sky dual-panel panoramic sunroof with a power sliding glass front panel and power sunshade. If you opt for the Trailhawk trim, you’ll get a raised ride height, available red tow hooks and 17-inch aluminum wheels. Needless to say, you’ll be the coolest driver on the streets of Moore. The 2018 Jeep Renegade might look small, but there’s nothing small about this Jeep’s capability. Just like its big siblings, the Renegade has no problem breaking down boundaries. No other SUV in its class can match the off-road capabilities of the Renegade. The only SUVs that can keep up are — yeah, you guessed it — Jeeps. If you want a completely trail rated vehicle, opt for the Trailhawk model. The vehicles that get to wear the Trailhawk badge have proven to perform well under many different off-road conditions. You can count on excellent traction, ground clearance, maneuverability, articulation and water fording abilities. The Jeep has two different 4X4 systems that will seamlessly switch between four-wheel-drive and two-wheel-drive for maximum efficiency, and the Selec-Terrain Control System lets you tune traction settings according to the conditions on the road, like snow, sand, and mud. Hill Descent Control monitors your throttle, speed and braking to ensure a smooth and safe descent. The 2018 Jeep Renegade is just as comfortable as it is capable, which is pretty impressive. Inspired by free-spirited fun, the 2018 Jeep Renegade interior is designed for spontaneous adventure in Moore and beyond. When you’re taking the backroads to the lake, you’ll experience a smooth and composed ride with confident handling. You also get the benefit of a high-quality cabin with perfectly-shaped seats to cradle you in comfort. New available premium mesh seating and a redesigned center stack step up the comfort level in style. The 2018 Jeep Renegade is equipped with the newest generation Uconnect systems, too. It comes standard, but you can also upgrade your screen to a 7-inch or an 8.4-inch display. Browse our new Jeep Renegade inventory online. 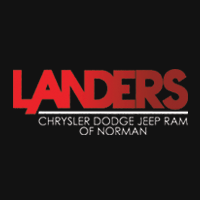 Get directions to Landers CDJR of Norman near Moore, Oklahoma.